I can remember a time when I was a waitress and I was serving a young family of four. The mother was clearly exhausted and her two young kids were, well, being kids and playing at the restaurant. As I walked up to take their order, her son who was probably around 4 years old picked up his glass of water, and poured it into her glass of water, which was already full. Dad tried to stop it. She said I’m sorry. I said I’m sorry. And the son didn’t quite know what he had just done and just stared at the mess. I think about this scenario probably more than I should. This boy trying to fill up a glass that was already full. And maybe it’s a cheesy illustration, but hold that picture for a moment. How can you fill up a glass with more water if it’s already full? You can’t. It has to be empty. When Jesus starts the Sermon on the Mount, he doesn’t start with “Blessed are the ones who have it all together. Blessed are the ones who are filled with their good works. Blessed are the ones who are full of self-righteousness. Blessed are the ones who are full of their legalistic lists of do’s and don’ts. He starts with . . . Blessed are the ones who are empty, the ones who have come to the end of their rope, the ones who are spiritually bankrupt, the ones who have nothing left to offer. Blessed are the ones who see their need for God. As long as we think of ourselves more highly than we ought, we are filled with pride, and have yet to taste of His grace. When we see ourselves as sinful, we see The Cross more clearly. When we see our need for God, we inherit the kingdom. Seeing our emptiness is seeing our need for God. It’s seeing our need to be filled. It’s a gift of brokenness that leads us to our Healer. Being poor in spirit is being brought low so that we can be lifted high. 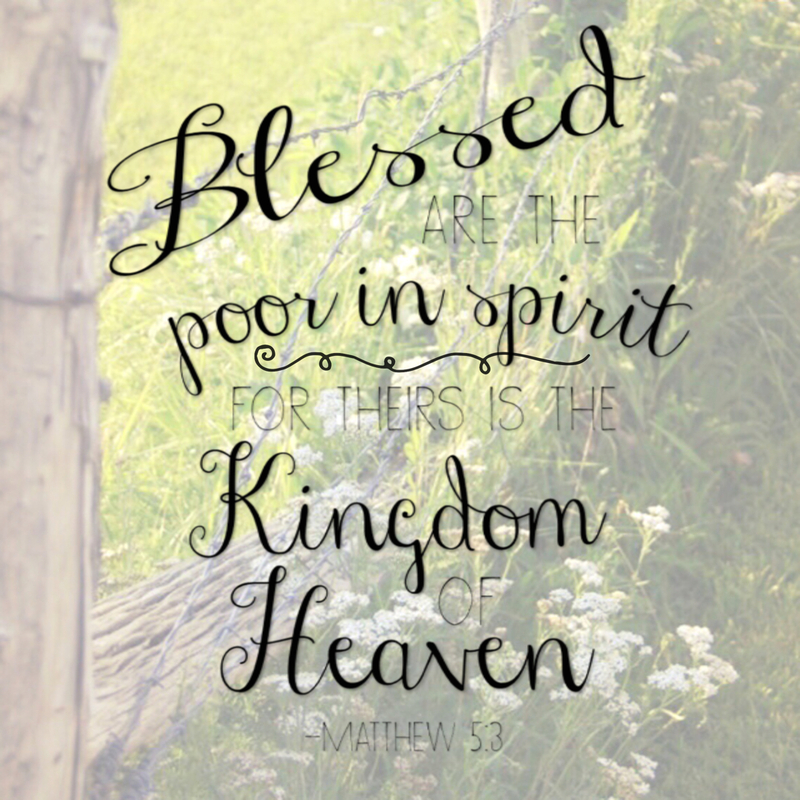 Being poor in spirit leads us to riches in Christ. Being poor in spirit is seeing our emptiness that leads us to His grace. 1. What does it mean to be poor in spirit? 2. Read Isaiah 66:2, Psalm 51:16-17, and James 4:10. What do all of these verses have in common? 3. Have you had a moment in your life when you realized you were poor in spirit? When did you recognize your need for Savior?